The family Arteriviridae presently includes a single genus Arterivirus. This genus includes four species as the taxonomic homes for equine arteritis virus (EAV), lactate dehydrogenase-elevating virus (LDV), porcine respiratory and reproductive syndrome virus (PRRSV), and simian hemorrhagic fever virus (SHFV), respectively. A revision of this classification is urgently needed to accommodate the recent description of eleven highly divergent simian arteriviruses in diverse African nonhuman primates, one novel arterivirus in an African forest giant pouched rat, and a novel arterivirus in common brushtails in New Zealand. In addition, the current arterivirus nomenclature is not in accordance with the most recent version of the International Code of Virus Classification and Nomenclature. Here we outline an updated, amended, and improved arterivirus taxonomy based on current data. Taxon-specific sequence cut-offs are established relying on a newly established open reading frame 1b phylogeny and pairwise sequence comparison (PASC) of coding-complete arterivirus genomes. As a result, the current genus Arterivirus is replaced by five genera: Equartevirus (for EAV), Rodartevirus (LDV + PRRSV), Simartevirus (SHFV + simian arteriviruses), Nesartevirus (for the arterivirus from forest giant pouched rats), and Dipartevirus (common brushtail arterivirus). The current species Porcine reproductive and respiratory syndrome virus is divided into two species to accommodate the clear divergence of the European and American “types” of PRRSV, both of which now receive virus status. The current species Simian hemorrhagic fever virus is divided into nine species to accommodate the twelve known simian arteriviruses. Non-Latinized binomial species names are introduced to replace all current species names to clearly differentiate them from virus names, which remain largely unchanged. The content of this publication does not necessarily reflect the views or policies of the US Department of the Army, the US Department of Defense, the US Department of Health and Human Services, or the institutions and companies affiliated with the authors. The taxonomic changes suggested/proposed/described here have been submitted as an official taxonomic proposal to the International Committee on Taxonomy of Viruses (ICTV) as TaxoProp #2015.001a-uS “Reorganization of the family Arteriviridae to accommodate 13 new species” (http://www.ictvonline.org). These changes (i) have not yet been endorsed by the ICTV Executive Committee, (ii) may differ from any new taxonomy that is ultimately approved by the ICTV, and (iii) are presented for discussion only but has no official standing at this point in time. In comparison to prokaryotic and eukaryotic taxonomy, viral taxonomy is still in its infancy. The most recent updates issued by the International Committee on Taxonomy of Viruses (ICTV) list <10,000 viruses that have been classified in <3,000 species [2, 3, 6, 7, 30]. The development and increasing adoption of metagenomic approaches in recent years have revealed that current measurements of global viral diversity are vast underestimates [8, 13]. For the foreseeable future, virus taxonomy will have to be revised continuously and sometimes substantially as new discoveries are made that challenge current taxonomic thinking . Objective techniques, such as viral genome sequence-based alignments and comparison algorithms, and automatic tools (in silico taxonomy decision trees) are used increasingly for virus classification to circumvent virus culture bias (i.e., the acceptance and classification of only that minority of viruses that can be grown in the laboratory). Updating existing taxonomies is crucial for classification to become database-compliant and user-friendly, while not violating the Rules of the International Code of Virus Classification and Nomenclature (ICVCN), which also are updated continuously [4, 5, 30]. Here, we address the taxonomy of the family Arteriviridae (order Nidovirales). Arteriviruses have monopartite, single-stranded RNA genomes of positive polarity. Large nonstructural polyproteins are directly translated from these genomes, whereas additional structural proteins are typically translated from nested sets of subgenomic mRNAs . We outline an updated arterivirus classification and nomenclature to incorporate recent discoveries and to address current shortcomings and inconsistencies for ease of application, clarity, and ICVCN compliance. The taxonomic history of equine arteritis virus (EAV), lactate dehydrogenase-elevating virus (LDV), porcine respiratory and reproductive syndrome virus (PRRSV), and simian hemorrhagic fever virus (SHFV)—currently the only accepted members of the family Arteriviridae—is complex. The reason for this complexity is in part because these viruses were discovered before the advent of modern molecular biological techniques. The isolation of EAV, the causative agent of equine viral arteritis, was reported in 1957 ; the isolation of LDV, which can cause disease in laboratory mice, was reported in 1963 ; and the isolation of SHFV, which causes simian hemorrhagic fever in Asian macaques, was reported in 1968 . Even the isolation of PRRSV, the etiological agent of porcine reproductive and respiratory syndrome, in 1991  (European/Lelystad “strain” or “type 1”) and 1992 [12, 19] (North American “strain” or “type 2”) predates the availability of routine genome sequencing. Consequently, initial classification of these viruses relied primarily on morphological features of their virions (Fig. 1), with subsequent reclassifications based on nucleotide sequences of genome fragments or, eventually, coding-complete or complete genomes generated from viruses isolated in vitro. None of these four arteriviruses were mentioned in the First Report (1971) of the International Committee on Nomenclature of Viruses (ICNV), the predecessor of the ICTV . In the Second ICTV Report (1976), EAV and LDV were considered related due to their similar protein composition  and listed as unclassified members of the family Togaviridae because of the similarity of their virions to those of classified togaviruses . SHFV joined this group of unclassified togaviruses in the Third (1979) and Fourth (1982) Reports [39, 40]. During subsequent years, the family Togaviridae was reorganized thoroughly. As a consequence, the genus Arterivirus was established and included in the family Togaviridae as a taxonomic home for EAV. LDV was considered a second member of this genus, and SHFV was removed from the family Togaviridae and placed into a group with hepatitis C virus in the newly established family Flaviviridae [51, 56]. However, the Fifth Report failed to take into account that EAV replication occurs via a 5′-3′-coterminal set of nested subgenomic mRNAs, a strategy not used by togaviruses or flaviviruses, but is characteristic of coronaviruses [20, 21, 28, 48]. Subsequent genomic studies confirmed the relatedness of EAV, LDV, PRRSV, and SHFV. Therefore, in the ICTV’s Sixth Report (1995), all four viruses were assigned to a free-floating genus Arterivirus . The ICTV’s Seventh Report (2000) formalized the relationship of arteriviruses and coronaviruses by including the genus Arterivirus in a new family, Arteriviridae, and by including this family and the family Coronaviridae in a new order, Nidovirales. EAV, LDV, PRSSV, and SHFV were assigned as single members to the four arteriviral species Equine arteritis virus, Lactate dehydrogenase-elevating virus, Porcine respiratory and reproductive syndrome virus, and Simian hemorrhagic fever virus, respectively [14, 23]. This taxonomy was upheld in the ICTV’s Eight (2005) and Ninth Reports (2011) and is still valid at the time of writing [24, 46]. A summary of this arterivirus taxonomy is given in Table 1. Eleven simian arteriviruses were discovered in recent years by next-generation sequencing in apparently healthy African cercopithecid nonhuman primates. Kibale red colobus viruses 1 and 2 (KRCV-1/2) were found in wild Ugandan red colobus (Procolobus [Piliocolobus] rufomitratus tephrosceles Elliot, 1907) from Uganda’s Kibale National Park [10, 35]. Kibale red-tailed guenon viruses 1 and 2 (KRTGV-1/2) were discovered in the same location in healthy red-tailed monkeys (Cercopithecus ascanius Audebert, 1799) . Mikumi yellow baboon virus 1 (MYBV-1) was found in yellow baboons (Papio cynocephalus Linnaeus, 1766) in Tanzania’s Mikumi National Park, and the closely related Southwest baboon virus 1 (SWBV-1) was detected in healthy captive olive baboons (Papio anubis, Lesson 1827) at the Southwest National Primate Research Center in San Antonio, Texas, USA . Results of a recent study identified two novel simian arteriviruses, Pebjah virus (PBJV) and simian hemorrhagic encephalitis virus (SHEV), as etiological agents of historical simian hemorrhagic fever outbreaks in Asian macaques, but their natural hosts remain unknown . During yet unpublished studies, Drakensberg Mountain vervet virus 1 (DMVV-1) and Kafue kinda-chacma baboon virus 1 (KKCBV-1) were discovered in vervet monkeys (Chlorocebus pygerythrus Cuvier, 1821) and Kinda baboons (Papio kindae Lönnberg, 1919) in South Africa and Zambia, respectively. Finally, a novel simian arterivirus was found in a DeBrazza’s monkey (Cercopithecus neglectus Schlegel, 1876) in Cameroon and its sequence was deposited in GenBank (Ng et al., unpublished). Analyses of the genomes of these eleven viruses clearly identify them as members of the family Arteriviridae. In fact, all arterivirus-defining elements (Figs. 1 and 2) can be identified unambiguously. Such elements include: open reading frame (ORF)1a and ORF1b encoding nonstructural proteins, ORFs2a–7 encoding structural proteins, and joined ORF1a and ORF1b (through a -1 programmed ribosomal frameshift site + RNA pseudoknot) encoding a polyprotein that is cleaved into main proteinase 3CLPRO, RNA-dependent RNA polymerase, putative zinc-binding domain (ZBD), helicase (HEL1), and uridylate-specific endoribonuclease (NendoU) [24, 47]) (Fig. 2). More importantly, all eleven simian arteriviruses are characterized by the presence of additional ORFs that are characteristic of the SHFV genome, but which are absent from the genomes of all other currently characterized arteriviruses (Fig. 2). A novel arterivirus was recently discovered in a forest giant pouched rat (Cricetomys emini Wroughton, 1910) in Cameroon (GenBank and Ng et al., unpublished). In 2012, Dunowska et al. published the partial genome of a novel arterivirus-like pathogen, wobbly possum disease virus (WPDV), found in common brushtails (Diprodontia: Phalangeridae: Trichosurus vulpecula Kerr, 1972), a marsupial introduced to New Zealand . The complete genomic sequences of WPDV were deposited in GenBank [unpublished data], and the virus was isolated in tissue culture in 2015 . Both the virus from the forest giant pouched rat and WPDV genomes contain all arterivirus-defining elements described above, and recent electron-microscopic studies revealed that the WPDV particles assume the typical arterivirion shape (spherical to icosahedral particles) [22, 27]. However, the WPDV genome sequence is highly divergent from the genomes of classified arteriviruses [22, 47], and WPDV is the first arterivirus found in a non-eutherian host. The current arterivirus nomenclature has species and virus names that are identical in spelling and are only differentiated by the presence or absence of italics and first word capitalization (e.g., the single member of the species Equine arteritis virus is called equine arteritis virus). Consequently, species names and virus names are often confused in writing, and virus abbreviations are often wrongly assigned to species rather than viruses. This practice obfuscates the distinction between species, which are conceptual entities, and viruses, which are physical entities [16, 31, 53]. Another problem associated with the current arterivirus nomenclature is that the current family and genus names are only differentiated by their suffixes (“-viridae” vs. “-virus”) but have an identical word stem (“Arteri-“). Since species-specific suffixes for the members of individual taxon hierarchies  are not yet accepted in the virology community, the members of both the family Arteriviridae and the genus Arterivirus are currently called simply “arteriviruses.” The word “arterivirus” will therefore become ambiguous as soon as a second genus is established in the family, as it will not be clear then whether “arterivirus” refers to the members of the one genus or to the members of the entire family. Finally, the current species names Lactate dehydrogenase-elevating virus, Porcine respiratory and reproductive syndrome virus, and Simian hemorrhagic fever virus contradict Rule 3.21 (“…shall consist of as few words as practicable”). host range. EAV, LDV, PRRSV, and SHFV are known to infect equids, rodents, suids, and nonhuman primates, respectively. The criteria listed above indicate that DMVV-1, KKCBV-1, KRCV-1, KRCV-2, KRTGV-1, KRTGV-2, MYBV-1, PBJV, SHEV, SWBV-1, and the viruses from DeBrazza’s and vervet monkeys should be grouped together with SHFV because these viruses 1) share the typical SHFV genomic architecture containing the SHFV-specific additional reading frames 2a′, 2b′, 3′, and 4′ (Fig. 2); 2) are more closely related to each other in pairwise distance analyses of genome-encoded proteins than to the proteins of the remaining arteriviruses (Fig. 3); 3) cluster more closely with SHFV in ORF1b phylogenetic analysis than with any of the other known arteriviruses (Fig. 4); and 4) infect cercopithecids (Old World monkeys), whereas none of the other arteriviruses are known to infect nonhuman primates. However, the pairwise genetic distances of the twelve simian arteriviruses are less than 50 % identical to each other on the nucleotide level. Such genetic distances are similar to the distance observed between the genomes of PRRSVs and LDV, PRSSVs and EAV, or LDV and EAV, all of which are currently classified members of separate species. These data indicate that eleven of the newly discovered simian arteriviruses might be representatives of novel arterivirus species, rather than novel members of the current species Simian hemorrhagic fever virus (Fig. 3). To confirm these results and to achieve an objective resolution of arterivirus relationships, we used the PAirwise Sequence Comparison (PASC) methodology  and tools available from the National Center for Biotechnology Information (NCBI). The PASC analysis aligns nucleotides in conserved protein or nucleotide regions of each virus pair. The resulting histograms visualize the distribution of the number of virus pairs at each identity percentage. A typical histogram has peaks that represent different taxon levels. The percentages of the lowest points of the valleys between the peaks can be used as taxon demarcation criteria. The results of the arterivirus PASC analysis are shown in Figure 5 (updates can be accessed at the NCBI website at http://www.ncbi.nlm.nih.gov/sutils/pasc/viridty.cgi?textpage=overview). Results from PASC indicate that the most appropriate genus cut-off for arteriviruses is 39–41 %. The most appropriate species cut-off would be 71–77 %, which is close to species cutoffs set for other viral families. These cut-offs result in a split of the current genus Arterivirus into 5 genera, a split of the current species Porcine respiratory and reproductive syndrome virus into two species (one for “European/Lelystad” PRRSV type 1 and one for “North American” PRRSV type 2), and the split of the species Simian hemorrhagic fever virus into ten species. not contain complete word stems of higher taxa (e.g., “arteri” or “nido”) but to again use contractions (“arte”). This choice will allow adherence to the ICVCN “stability rule”: i.e., the chosen genus names could be retained even if future taxonomic reorganizations would require the dissolution of the family Arteriviridae or the order Nidovirales, or if individual genera would have to be moved to separate families. To differentiate species and virus names clearly, the ICTV-supported proposal to employ non-Latinized binomial species names was followed . In the proposed classification, the virus name “equine arteritis virus” and its abbreviation “EAV” are retained, therefore avoiding any significant impact of this taxonomic proposal on the arterivirus research community. However, the name of the species for EAV, which rarely has to be used in daily proceedings by virologists, is changed to Equid equartevirus. Similar changes are introduced for species of the remaining genera. The virus name “lactate dehydrogenase-elevating virus” is retained, but its current abbreviation (LDV) is changed to LaDV to differentiate it from lymphocystis disease virus (LDV, an iridovirus of teleost fishes). To reflect the relatively large distance between the two “strains” LDV-P and LDV-C, both strains are elevated to virus status (LaDV-1 and LaDV-2). The species name harboring these viruses is changed to Muroid rodartevirus. The current species Porcine respiratory and reproductive syndrome virus is split into Suid 1 rodartevirus and Suid 2 rodartevirus for “European/Lelystad” porcine respiratory and reproductive syndrome virus type 1 (now renamed PRRSV-1), and “North American” PRRSV type 2 (now renamed PRRSV-2), respectively. The genus Simartevirus includes ten species. Seven of these species are named after the species for the hosts the viruses were discovered in: Cercopithecus 1 simartevirus for KRTGV-1 and KRTGV-2; Cercopithecus 2 simartevirus for the arterivirus from the DeBrazza’s monkey; Chlorocebus 1 simartevirus for DMVV-1; Papio 1 simartevirus for MYBV-1 and SWBV-1; Papio 2 simartevirus for KKCBV-1; Procolobus 1 simartevirus for KRCV-1; Procolobus 2 simartevirus for KRCV-2. The hosts of the three simarteviruses known to have caused epizootics among captive macaques (PBJV, SHEV, SHFV) are unknown. Consequently, the names of the species these viruses belong to were chosen based on the cities in which the outbreaks occurred: Alamogordo simartevirus for PBJV; Bethesda simartevirus for SHFV; and Sukhumi simartevirus for SHEV. Host names were once again used for the species established for WPDV (Trichosurus 1 dipartevirus) and the arterivirus from the forest giant pouched rat (Cricetomys 1 nesartevirus). The virus found in DeBrazza vervet monkeys was named DeBrazza’s monkey virus 1 (DeBMV-1), and the virus found in forest giant pouched rats was named African pouched rat virus 1 (APRAV-1). Pronunciation guidelines for all arterivirus names are listed in Table 3. Together, this new taxonomy resolves all previous disagreements with the ICVCN while at the same time accommodating all newly discovered arteriviruses and providing relative consistency with previously established virus names and abbreviations. To improve retrieval of arterivirus genomic or protein data from electronic databases, we propose that arterivirus strains/variants/isolates be named according to the NCBI-supported naming scheme recently proposed for filoviruses [32, 33, 34] and rotaviruses : <virus name>/<strain>/<isolation host-suffix>/<country of sampling>/<year of sampling>/<genetic variant designation>-<isolate designation>. References [32, 33, 34] contain detailed instructions on how to fill in the individual fields of this naming template in a standardized manner. We also strongly suggest not using the word “strain” indiscriminately [32, 33, 34]. A consortium of arterivirus experts should be established under the auspices of the ICTV Arteriviridae Study Group to decide on the precise strain/variant/isolate names for the several thousand arteriviruses currently indexed in databases such as GenBank. NCBI is currently developing gene and protein naming standards for viruses to improve electronic database management. Generally, we propose not to change gene and protein names at this point. The taxonomy of the family Arteriviridae will most likely have to be amended and expanded repeatedly in the future. Evidence is accumulating that the diversity of arteriviruses is higher than currently appreciated [43, 49, 50]. Furthermore, the paraphyly of horses, nonhuman primates, pigs, possums, and rodents within the class Mammalia  suggests that many other mammalian orders may host as yet undiscovered arteriviruses. 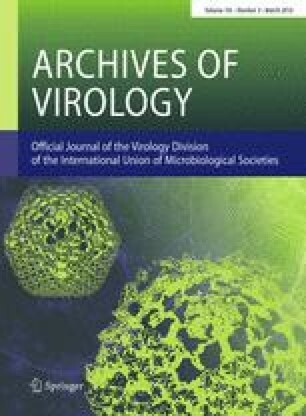 The establishment of methods-of-choice for arterivirus taxon demarcation and the implementation of unambiguous taxon and virus names in line with ICVCN will prove to be a solid foundation for the taxonomic accommodation of arteriviruses that will undoubtedly be discovered in the future. This work was funded in part through Battelle Memorial Institute’s prime contract with the US National Institute of Allergy and Infectious Diseases (NIAID) under Contract No. HHSN272200700016I. Battelle employees involved in this work are: L.B. and J.W. Subcontractors to Battelle Memorial Institute who performed this work are: J.H.K and E.P., employees of Tunnell Government Services, Inc.; A.N.C. the owner of Logos Consulting, Inc.; and M.G.L., an employee of Lovelace Respiratory Research Institute. This work was also funded in part through National Institutes of Health (NIH) grant TW009237 as part of the joint NIH-NSF Ecology of Infectious Disease program, grant R01 AI077376, and by the Office of Research Infrastructure Programs (ORIP) grant P51OD011106. This research was also supported in part by the Intramural Research Program of the National Institutes of Health, National Library of Medicine (Y.B. ), and benefited from contributions from the PREDICT project of the United States Agency for International Development (USAID) Emerging Pandemic Threats Program. We thank the Cameroon government for their support during the implementation of this project.